Gold may or may not make you money, and it doesn’t pay dividends. But when there’s a currency crisis, gold has proven to protect your savings against losses. Such is the case right now in Russia, where the ruble has lost about half of its value. In this edition of the Market Report, Will Hart and Jake Kennedy explain exactly why gold is such a critical component of your portfolio for just this reason. Several big names from the financial world have recently came out in favor of gold, including former Fed Chair Alan Greenspan who said that given its value as an international currency and that it’s unaffected by government decisions, gold is a good place to put your dollars these days. Yet, many financial advisers and stock brokers still don’t advocate gold. Why? Listen to our latest edition of the Market Report with Will Hart and Jake Kennedy. Last month, Wickwire gave some reasonable arguments as to why one should buy gold. “I believe, he said, “that now is a good time to take advantage of the negative sentiment short-term trading sentiment.” Is Wickwire right? Do you really need gold in your portfolio? Listen to our latest edition of the Market Report. The Market Report: What’s the Outlook for Gold in 2015? With gold prices hovering near four-year lows, what should we expect in the gold market in 2015? Listen to what Jake Kennedy and Will Hart have to say in this edition of the Market Report. Alan Greenspan surprised many Americans with his recent advice to stock up on gold. Although it’s rare to hear such advocacy for gold from a former Chairman of the Federal Reserve, Greenspan’s appreciation for gold is far from surprising. In this edition of the Market Report, hear what Will Hart and Jake Kennedy have to say about Greenspan and gold. Market volatility, associated with a higher probability of a declining market, makes it hard for many people to plan ahead. In our latest edition of the Market Report, Will Hart and Jake Kennedy explain how hard assets like gold and other precious metals may provide a hedge against market ups and downs. Get all the facts here. The Market Report: Should the Fed End Its Money Printing Scheme? Is the economy addicted to stimulus? How can we protect ourselves from government policies and market volatility with gold? The Federal Reserve is preparing to end its third round of bond buying next week. In this edition of the Market Report, Precious Metal Specialists Will Hart and Jake Kennedy discuss Quantitative Easing, inflation, dollar devaluation, and gold as a safe haven asset. Listen to the full report here. Why Are Gold Prices Down Right Now? Is It a Good Time to Buy Gold? While the yellow metal’s price has been trending down this year, major corporations and countries such as India and China are stockpiling gold, and many experts are warning of another market crash. Is now the right time to buy gold? Listen to our latest edition of the Market Report to learn more. The Market Report: Why Own Physical Gold and Not Paper Gold? Paper gold refers to certificates that may or may not be backed by the real thing, while physical gold is gold that you physically posses in the form of coins and bars. In this edition of the Market Report, Gold Specialists Will Hart and Jake Kennedy answer common questions about physical versus paper gold: Why own physical gold and not paper gold? Isn’t it a hassle to store and sell physical precious metals? And what are the advantages of owning physical gold? Listen to the entire report here. The Market Report: Is Inflation Really a Problem? The Fed insists inflation is under control. Is it really? 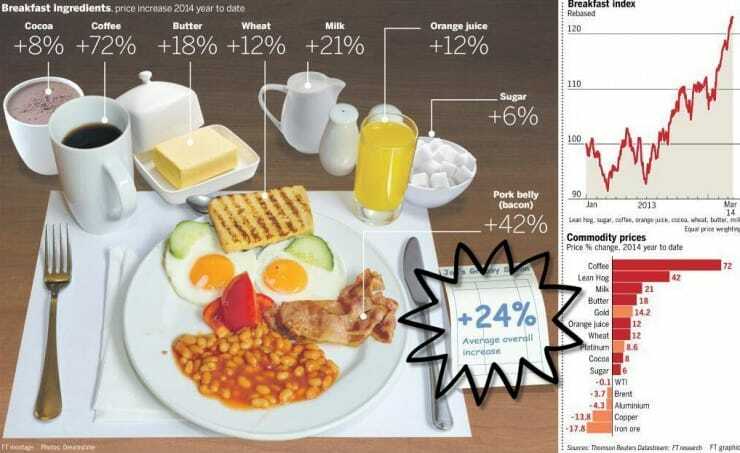 According to Financial Times, the cost of the most important meal of the day rose 24% year to date, with coffee being the biggest gainer going up over 70%. In this edition of the Market Report, Will Hart and Jake Kennedy tell us why we should be worried about inflation, even though the Fed says it’s all fine and dandy. Get all the facts here.